I think about this recipe all winter, as I look forward to spring. It only takes ten minutes to prepare. Recipe by Devra Gartenstein, from Local Bounty: Seasonal Vegan Recipes, by permission of The Book Publishing Company. 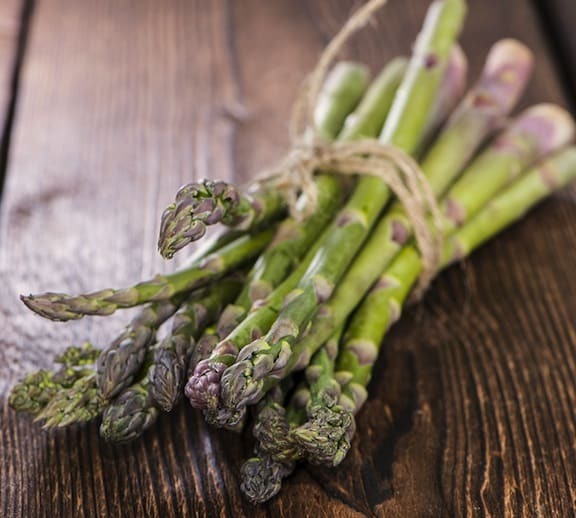 Bring 1 quart water to a boil in a medium saucepan and blanch the asparagus for about 15 seconds. Drain and run it under cold water for 1 minute. To make the sauce, heat the oil in a small saucepan. Add the garlic and cook on low heat for 1 to 2 minutes. Remove from the heat, add the lemon juice, optional dill, mustard, salt, and pepper to taste, and mix well. Toss the asparagus with the sauce and let stand for 10 minutes before serving. Do you cook the asparagus only for 15 seconds? I would think that would barelyi get them warm, much less cooked to any degree. The recipe says to cut the asparagus in 2 inch lengths, but the pic accompanying the recipe shows full–length asparagus spears in a serving dish with the sauce spread over the middle of the spears, not 2-inch pieces tossed in the sauce. Tried this for Easter dinner. The asparagus was delicious after blanching it or about 20 seconds. The sauce was awful. maybe you should specify the amount of lemon and not a generic term like “juice from half a lemon”. My attempt was WAY to lemony. Tried everything to fix it. We ended up just washing it off the asparagus. And I agree with Dwight. The picture definitely doesn’t match the description. Being on a fat free diet and preferring a hot more cooked version, I steamed the asparagus for 7 minutes in simmer. First bring the teamer pot to a boil then turning down to simmer. The sauce was made just as described with 2 large garlic cloves and Dijon style mustard. Uncooked sauce substituted water for oil and let it sit for 4 hours refrigerated. The dill was garden fresh and a full compacted tablespoon finely minced. A new favorite sauce. We served it with a side of whole wheat pasta under the asparagus and then drizzled the sauce over the whole affair followed by a light sprinkle of parmesan. WOW Thanks so much for the idea! It was a great recipe! We really enjoyed it. We just drizzled it on top of the asparagus and it was yummy! I also prefer it hot so I just steamed the asparagus. I am also the world’s worst cook and managed to make it and have it taste good. It was actually really easy! But it looked gourmet. I thought I’d had garlic so I didn’t grab any at the store when I went to get the asparagus, and didn’t want to go out again so I just used granulated garlic. It worked really well as a sub. Thanks, Christine — glad you enjoyed this! And now, voila — you are no longer the world’s worst cook.